What does a hero look like? What does it mean to serve? Much of this is going to look a bit odd and out of place on a blog concerned with how we think about things, but bear with me, because there is a reason. However, it does raise a question about what people consider service, and what constitutes fighting for rights. I'm going to dedicate some space here to Tee Marie, because she is, in my humble opinion, the embodiment of all that's good in our species. I hadn't heard of her until she followed me on Twitter but I'm really glad she did, because she's an inspiration. In some respects, Tawana (Tee) Marie Hanible's early life reflects well-worn stereotypes for a girl from the South Side of Chicago. In others, not so much. Raised in a foster home along with her brother after the death of her father, she was initially a good student. At 15, though, her life took a downward turn, culminating in her expulsion from school for an act that would reflect her sense of service later in life, when she triggered a fire alarm to allow a friend to escape a beating. Her adopted mother, Minnie Hudson, enrolled her in a military academy run by the National Guard in Illinois, and it was here she found her feet, really turning her life around and finding the structure that would shape her future. After college, Tee did what her brother had said she was 'too girly' to do, she enlisted in the US Marine Corps, where she excelled, smashing the aptitude test and scoring almost double what was required for men to pass. She was chosen among the first female entrants into the combat course that was, until that point, reserved for male marines. After training, she was billeted to an admin post, entered an ill-fated marriage, and had her first daughter. As with many, this event was a catalyst and, as she herself says, “When we got word that we were gearing up to go into Iraq, I wanted to be part of defending our country”. At that time, she was responsible for writing billet orders for marines going overseas and, on seeing an opening for an admin chief serving in Iraq, she billeted herself. Her CO, Chief Warrant Officer Ronnie McPhatter, spent some time trying to talk her out of it, pointing out that she was a mother, but she insisted that she felt it was something that she had to do. 'I need to go', she said. She was the first woman on the ground in Iraq with the US deployment, something that itself brought challenges not previously faced by the Corps. Whatever your views on the deployment to the Persian Gulf, there's no doubting that this is the story of a woman dedicated to fighting for the rights and freedoms of others. But the story doesn't end there. On returning from deployment after seven months, Tee found herself, like many coming home from service overseas from deployments throughout history, feeling a little extraneous. Her family were well-organised, and she felt a bit like a spare part. She returned to Camp Pendleton a week later, Taking her daughter, Destiny, with her, and Tee was relieved to find that her deployment hadn't had any lasting effect on Destiny's development. Tee also remarried and had a second daughter, Jasmine. I won't belabour this any further, not least because all of this and more is freely available, and I still want to get to the meat of this topic. I will link the Newsweek article that I sourced much of this from at the bottom, and I recommend taking the time to discover for yourself what this remarkable woman, every inch the Marine Gunnery Sergeant and citizen of humanity, has achieved. Let's skip forward a little, as I want to move onto other things. 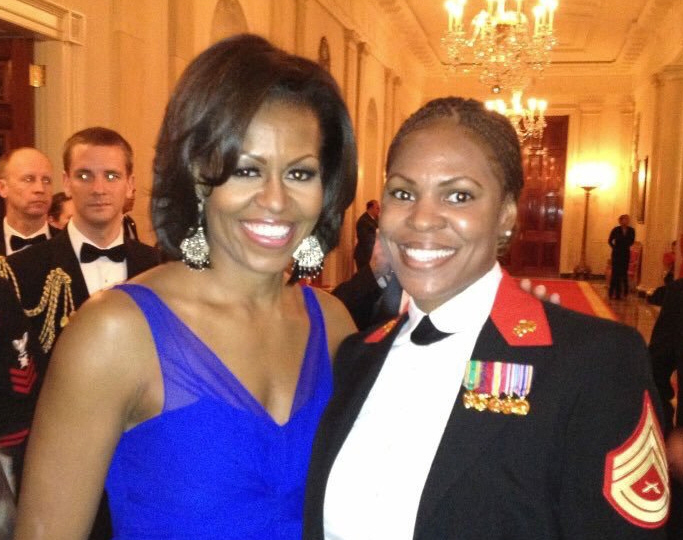 During her time as a recruiter for the Marine Corps, Tee encountered many young people who, for one reason or another, failed to qualify, and aspirations dashed, returned to the lives the fates had chosen for them. This didn't sit well with Tee, who determined that she wanted to try to make a positive impact on this situation. She hunted around for opportunities to volunteer for mentoring work and, finding none, she exercised her indomitable spirit, honed in the Corps, and decided that she'd simply create the opportunities herself. She founded a non-profit, Operation Heroes Connect, which aims to connect servicemen and women with young people in need of guidance and mentors. It wasn't easy, and her early experiences were difficult. In one situation, a young person in a homeless shelter, let down by a mentor who'd promised and failed to show up, rejected her advances. She patiently sat with him day after day, talking and guiding until he eventually capitulated. This young man has since joined to serve, and is making a life for himself. Following on from this, she connected with other marines returning from active service, and in need of new challenges, and has since expanded this effort, connecting ex- and active service personnel with young people, and helping them to bootstrap themselves into positive lives. I'm going to move away from Tee now, but I urge you to follow her on Twitter, and to offer your support to this stupendous organisation. There are other forms that service takes, and not all of them are immediately obvious, but I want briefly to touch on them here. During my research for this article, and in some of the circumstances that have arisen since first I began it, I've been led down a bit of a rabbit hole. Some of what I'm about to cover is going to be the subject of a couple of future posts about the way we think about something else, namely authority, and that topic has arisen directly out of looking for other forms of service. There's an increasing movement of people taking videos of public officials during the execution of their duties. One could argue, not very successfully in my humble, that there's a problem with people going out with cameras looking for confrontation in this manner, but the simple fact that the confrontations occur is an issue, and one that needs to be addressed. I've seen some horrendous apologetic in the comments sections of some of these videos, such as the notion that 'the police should be left to do their jobs in peace'. This, of course, overlooks the fact that, when the police overstep the bounds of their consent-granted authority, they're not engaged in their duties but, in many cases, criminal activity of their own. For instance, in the US, there are certain rights protected by the constitution. Among these is the right to go about one's business without being molested by government officials without sufficient reason (4th amendment). What we see in practice is such things as immigration checkpoints in several border states but not actually at the border. There are many videos of people being stopped as much as fifty miles from the border and being asked if they're US citizens. In some cases, people are hauled from their vehicles simply for not answering their questions which, again, is a protected right (5th amendment). Now, the checkpoints themselves don't constitute an infringement of rights as long as they're applied without discrimination of any sort, but they have no authority to arrest or detain unless they have a reasonable, articulable suspicion (probable cause) that an offence is being committed, and exercising the right to silence, or indeed any other constitutionally-protected right, doesn't constitute probable cause under law. Further, they're actually waging war, in a sense, against the constitution, which could, at a stretch, be considered treason (I wouldn't support this conclusion, but some do). In reality, those conducting these checks, whether you agree with them or not, and regardless of whether they're motivated by a desire for a confrontation that you know you will win, constitutes service. The motivation is entirely irrelevant in the facts of the issue, and arguing otherwise constitutes a fallacious appeal to motivation, a subset of the well-poisoning fallacy. Finally, I want to talk about something that's been very much in the news of late. It's the story of Colin Kaepernick, a quarterback who, while playing for the San Francisco 49ers, refused to stand during the national anthem. This was in protest at the prevalence of fatal shootings of black men by police, and the abject failure of the criminal justice system to do anything about it. This is, once again, the 1st amendment in action, which guarantees the right of any person to speak and express themselves freely and to peacefully protest at any action of government, whether federal or state, that one sees as having an impact on the society we all must share. A lovely response was given by Kareem Abdul-Jabbar, all-time leading scorer for the NBA, UN cultural ambassador and author, who you may remember from such films as Game of Death and Airplane! In an article for the Washington Post, he discusses Army Reserve 2nd Lt. Sam Kendricks who, during the Olympics in Rio de Janeiro, stopped in his run-up in the pole vault event when he heard the Star-spangled Banner playing, dropped his pole, and stood, hand on heart, in an act of spontaneous patriotism. This particular article has been languishing unfinished for some time, for which I owe Tee Marie an apology, because we first discussed it quite some time ago. I make no excuses, because none are apposite, but it's the continuation of this once again on twitter that prompted me to drop what I was doing and get it finished. Here, I'll simply reproduce my response to this ridiculously vacuous question. In summary, we do what we can. Those of us who can fight with arms, do so when it's necessary. Those of us who, for one reason or another, can't fight with arms, give service in other ways commensurate with our abilities. Ultimately, fighting for rights and freedoms comes in many forms, peaceful protest for some, confrontation for others. When you rail against those who give such service, whatever form that service takes, what you're actually doing, as discussed in Permission to Speak Freely? is forging your own shackles. More importantly, you're forging mine and those of the people I love, and up with that, as the Hitch famously said, we will not put. A citizen accepts personal responsibility for the safety of the body politic; a civilian does not. That's not a bad summation of what service entails, though I'd go further, and suggest that a citizen takes personal responsibility for the safety and freedom of her fellow humans. All of the above are representative of taking such responsibility. As always, thanks for reading, and a special thanks to my regular readers and supporters, whose patience is saintly, and whose continued support tells me I must be doing something right. Let me once again urge you to support, whether by donation or by spreading the word, the wonderful Operation Heroes Connect. As a mentor to young people in a different setting, it's impossible to overstate the value and importance of the work being done by Tee's organisation, and other organisations around the world that are taking on the responsibility of the well-being of the most vulnerable in our society, and such organisations need all the help and support they can get if they're to continue to do this valuable work and extend it to more who need it. I'll also, somewhat under duress, add a word about my own donate and Patreon buttons. As with all such things, producing this blog takes a lot of time and effort, not least the research to make sure that the information I present is well-supported and useful. I'm loathe to ask, and indeed only added these facilities at the behest of some of my regular readers and friends. However, this blog is currently my sole source of income, and the closer I can get to making it self-sustaining, the more time I can dedicate to producing worthwhile content. The donate and Patreon buttons are located up on the right.